Sacajawea Hall, Brandon King, Elijah Williams, Kali Akuno and Fa’Seye Aina Gonzalez (left to right) are five members of a delegation Cooperation Jackson is sending to Paris for the upcoming COP21 Climate Conference. Photo by Imani Khayyam. Six members of Cooperation Jackson, along with several children, a translator and someone to help with child care are headed to Paris, France, to lend their voices and efforts to the global fight against climate change at the United Nation's annual climate conference, referred to as COP21, beginning Nov. 30. The local contingent will join a larger delegation of nearly 100 people from the United States and Canada organized by the Grassroots Global Justice Alliance, or GGJ. "The goal is half protest and half affirmation," said Kali Akuno, a longtime social-justice advocate and co-founder of Cooperation Jackson who worked in the mayoral administration of the late Chokwe Lumumba. The political leaders and corporations involved in the official discussions about climate change are "playing games with the planet and with our lives," Akuno added. GGJ is helping pay for four members of the Jackson delegation to make the trip. The group works to connect working-class and oppressed communities from North America with social movements in the southern hemisphere. Cooperation Jackson is also part of the Climate Justice Alliance's "Our Power Campaign," a parallel effort to end global warming while specifically supporting, connecting and learning from those communities of poor and working people who have directly suffered the effects of climate change. The protest is important, Akuno said, because at this point the government and industry officials meeting at COP21 "control some of the key levers and institutions which can either save us or drive us further off the cliff." So, he said, Cooperation Jackson is "joining with other communities of struggle throughout the world to send a clear message that this is not sufficient, that they have to do better, and we're demanding that they do better." This year's event comes just weeks after Obama's rejection of TransCanada's proposed Keystone XL pipeline, which would have funneled one of the world's largest crude oil reserves from the Alberta Tar Sands to the Gulf of Mexico. The COP21 website emphasizes that world leaders will, for the first time in more than 20 years of UN climate negotiations, set a "legally binding and universal agreement" that aims to indefinitely keep global warming under 2 degrees Celsius. But the Cooperation Jackson delegation will be in Paris as part of a parallel gathering of communities from across the globe converging to challenge the official standards that are set to emerge from COP21. Sacajawea Hall, of Cooperation Jackson, said that it's critical for communities of protest to send a message and hold leaders accountable, but also to connect with communities across the globe who are already practicing alternatives to the current oil-and-profit based economy that scientists say is threatening the planet. "So much of it for me is gathering with other communities who are actively asking, 'What do we want for ourselves and our world?' and not just "What do we not want from our governments?,'" Hall said. Both Hall and Akuno stress the need for the delegation to learn from the successes and failures of alternative-energy-based movements at COP21, and to bring those lessons home. Hall finds inspiration for her work in "the stories of what people, and women in particular, have been able to do with even less resources than we have here" in Jackson and in the United States as a whole. Citing Mahatma Gandhi's maxim that we must first try to "be the change we wish to see in the world," Aina Gonzalez, another Jackson delegate, said this trip is a chance for Cooperation Jackson to "network, show our presence, make friends and build allies." Locally, Gonzalez is helping to launch Nubia's Place Cafe and Catering, a food-service cooperative that will run out of the Lumumba Center for Economic Democracy, the group's base of operations at 939 West Capitol St. in Jackson. The cafe is an example of the integrated, sustainable economic alternatives Cooperation Jackson says it wants to model for the city and state. An urban farming cooperative will source the cafe and catering businesses, whose workers will have a share in ownership and management and receive what organizers call a fair, livable wage. In turn, the business of sustainably producing and serving food will present the need and opportunity for sustainable waste management, recycling and composting practices. The goal of making Jackson "the most sustainable city in the south" comes out of the "Jackson Rising" statement that former Mayor Chokwe Lumumba's administration released in 2014. Akuno credits Lumumba's administration with laying out the broad vision Jackson needs to incentivize local policies and business practices that are both just and ecologically sustainable. The work of Cooperation Jackson hones in on one aspect of that broad social vision—the development of worker-owned cooperatives and alternative economic practices. 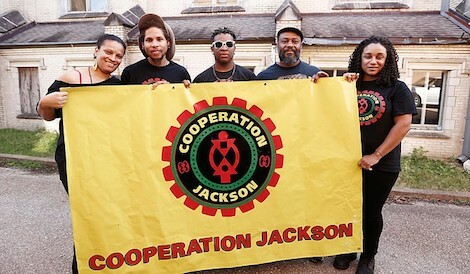 In part due to Mississippi's long history of rural and industrial worker organizations, Akuno says that "the conditions of Jackson are challenging but also ripe for cooperatives as a means of getting to a solidarity economy." Moving toward an economy that puts people's needs over profit would, he believes, best serve the people who live and work in Jackson. The ambitious goal of a zero-waste-and-emissions Jackson by 2025 is just one part of "The Jackson Just Transition Plan," a climate-justice vision Cooperation Jackson released this week as part of the international "Our Power Campaign." The plan lays out a "Sustainable Communities Initiative" that has two primary components. The first is an "Eco-Village" in west Jackson, which will build on emerging cooperatives to develop the infrastructure for west Jackson residents to sustainably live and work in their communities. This part of the plan is predicated upon the creation of a Community Land Trust, controlled by residents, and a network of interconnected cooperatives that will provide affordable housing and jobs that respect workers' rights. The plan also contains a "policy reform" agenda that aims to help city government realize the Lumumba administration's vision of making Jackson the most sustainable city in the south. The strategy articulates "zero waste" and "zero emissions" programs and outlines policies designed to mitigate ecological destruction while incentivizing just and sustainable business practices. For example, it calls on city government to invest in localized food production and citywide recycling and composting programs, while transitioning to a city fleet and public-transportation system run entirely on renewables. While "The Jackson Just Transition Plan" would require buy-in from city leaders to achieve policy reform, the plan grounds those policy goals in a political vision that looks to connect the dots between the environmental, economic and racial crises that have long plagued the south. It is that political vision, as well as the nuts and bolts of what does and doesn't work for communities engaged in similar struggles throughout the world, that the Jackson delegation says it hopes to discover, share, and refine in Paris. "It's important for the global community to come together to show that we already have the resources and power to create sustainable and just communities," said Cooperation Jackson member Brandon King, a 31-year-old Virginia native with a background in activism and the arts who now lives in Jackson. See Cooperation Jackson's website at cooperationjackson.org. Email ideas to business reporting fellow Scott Prather at scott@jacksonfreepress.com.